This summer, I have planned two major events for August. 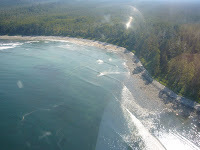 First, the 40k Nootka Trail will be run on August 8th and shortly thereafter, the 47k Juan de Fuca Trail on August 22nd. The Nootka Trail, as far as I know has never been run before by anyone. Not because it is impossible, or overwhelmingly difficult, but it is simply off the beaten path. 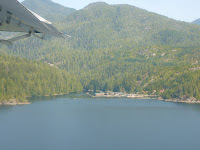 With the only access to and from the trail being either floatplane or boat, the logistics and cost are a definite factor. However, after a year of figuring things out, everything (plane, boat, hotel, tides, etc.) is now a go for Saturday, August 8th. So now the easiest part remains: run the trail! I will be running the trail with my usual partner-in-crime, Bob Wall. 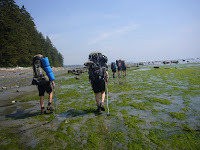 He and I partnered up last year for the North Coast Trail and Juan de Fuca Trail Runs, and also in 2007 when we did the famed West Coast Trail run. It only made sense to complete the final coastal trail together. Interestingly enough, once this trail has been completed by us, for the first time ever, it will be possible to get an actual running time from Port Hardy to Port Renfrew along the West Coat of the Island. Not that this time will be of importance to anyone, bu it will be a cool fact that we have conjured up. 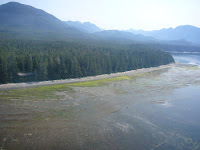 In the next month, I plan on studying the Nootka Trail so that every detail in known to me ahead of time. I have a small guidebook that contains a map and some details of the trail. I know that the trail is almost exclusively coastal, and not your typical wooded environment. 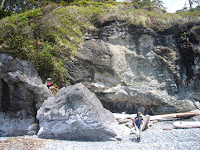 I also know that the trail should best be taken on at low tide, in so that one can take advantage of the flat sandstone shelves that lie in the water. 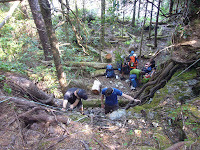 Ironically enough, one of my school outdoor experience trips did the Nootka Trail in late May. 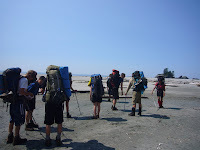 Although I did not go, I gave some instructions to the school chaperons to bring back a full verbal report on the trail. I also was hoping that a few students would take some photos of the trail. 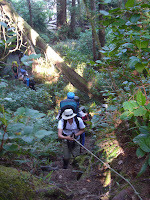 I'd like to thank grade 10 student Helen Ip for these photos of the trail. 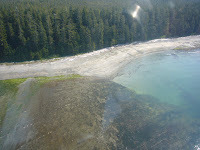 Some were taken from an aerial viewpoint from the floatplane prior to them hiking the trail, and some were actually taken on the trail. I am hoping that gaining as much info before running the trail will help me greatly when August 8th arrives. Jeff, what is the name of your book? HaHa - don't have one yet. Maybe when all the adventurer are done, I'll write something up. For now, I'm just living the dream.